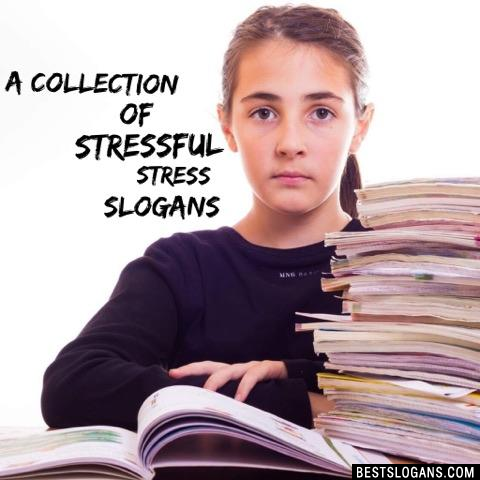 18 new entries added to stress slogans, stress management slogans, that include pictures. 1. We bring health & relaxation to you. 1 We bring health & relaxation to you. 2 Treating stress, pain, and injury. 3 There is more to life than increasing its speed. 4 The time to relax is when you dont have time for it. 5 Talking body, listening hands. 6 Stress is simply the adaptation of our bodies and minds to change. 7 Stress is an ignorant state. It believes that everything is an emergency. 8 No one can get inner peace by pouncing on it. 10 Modern stress - toxic evil. Toxic stress - modern evil. 11 Look good. Feel better. Live longer. 13 Give your stress wings and let it fly away. 14 For fast-acting relief, try slowing down. 16 A natural approach to better health. 17 A step to better health. 18 Change the way you feel. Can you think of a good Stress Slogans we're missing? Or come up with a clever one of your own. Please share below.